Baby boomers are pulling into their golden years locked and loaded. According to stats from the National Rifle Association, 22,739 people age 65 and older took basic firearm training courses from NRA-certified instructors in 2015. That was four times higher than the number from just five years earlier. We came across that statistic in a story in The Wall Street Journal that examined the rise in the number of seniors taking up shooting, whether as a hobby or as the result of a desire to be able to protect themselves and those they love. 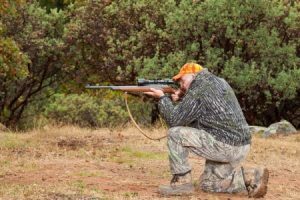 Firearms dealers around the country can also back up the numbers, with many older Americans coming to their stores in search of a new pistol, rifle or shotgun. Newly minted seniors are turning up at shooting ranges looking for a new challenge that’s a little more forgiving on aging bodies than tennis or golf, but packs more of a punch than mahjong. Shooting fits the bill, particularly for women of a certain age. You don’t have to be tall or strong or fast with shooting. You don’t even have to be able to walk to excel in a sport that’s all about stillness and control. Keep the shooting sessions to an hour or shorter. You’ll be using muscles you didn’t know you had, so limit your time so you don’t end up stiff and sore the next day. Sight in your first targets at 3 yards and practice your shot grouping. With more time, stretch out the distance and work up to 5 yards or further. Stay hydrated and bring a high-protein snack like peanut butter or energy bars to make it through your whole shooting range day. If you’ll be outside, don’t forget to dress for the temperature and your sun exposure, wearing sunblock as needed. You’re worth it. Safety glasses are a must, along with the best shooting hearing protection you can afford. A gunshot can ring in the neighborhood of 120 decibels, and if your hearing isn’t what it used to be, we help you preserve and protect it. The sound amplifying feature of ESP’s products allows you to have comfortable conversations and hear quiet sounds like the flush of a bird while still protecting your ears from loud, harmful noises. Electronic Shooters Protection offers a full range of hearing protection technologies that can preserve your hearing and diminish the detrimental impact of spending a day shooting at the range. Take a look at our online shop now, or call us today at 303-659-8844 and determine the best protective wear for you.